Conor McGregor left UFC fans stunned as he announced his shock retirement from MMA. With his suspension ongoing, talk has been rife as to his next fight but McGregor looked to call time on his career on social media, only for fans to simply refuse to believe it is not a hoax. 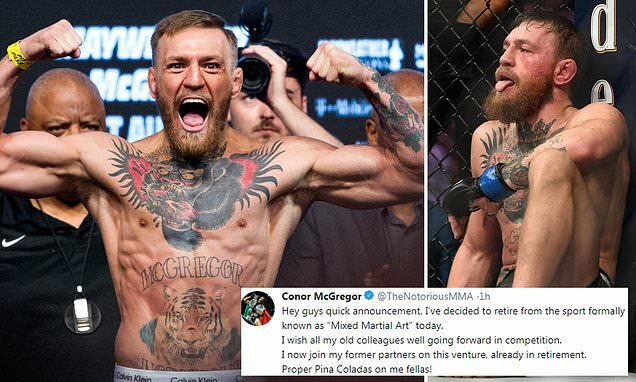 Posting on his Twitter page in the early hours of Tuesday morning, McGregor wrote: 'Hey guys quick announcement, I've decided to retire from the sport formally known as 'Mixed Martial Art' today. I wish all my old colleagues well going forward in competition. The news was particularly shocking given it came hours after an appearance on 'The Tonight Show' with Jimmy Fallon in which he claimed he was currently in negotiations with the UFC about a return to the octagon in July.